Zybez RuneScape Community was shut down on September 17th, 2018. You're viewing an archive of this page from 2018-12-05 at 20:51. Thank you all for your support! Please get in touch via the Curse help desk if you need any support using this archive. For those of you who participated on last years topic: http://forums.zybez....y-this-year-v2/ Take a look at your goals and your gains. :) Also if you'd like to participate for this year. Edited by Matt258, 06 January 2015 - 11:34 PM. Going for 200M All Skills. It would be GREAT if you could Loan me Gp & I'll be paying you back with Interest! 40% Interest back to you. Help me Collect Aluminum Cabs & Tabs for a Guinness Book of World Records! Collecting Aluminum Cans (for Cancer Research) & giving the Tabs to Ronald McDonald House Charities. Help me Collect Aluminum Cabs & Tabs for a Guinness Book of World Records! 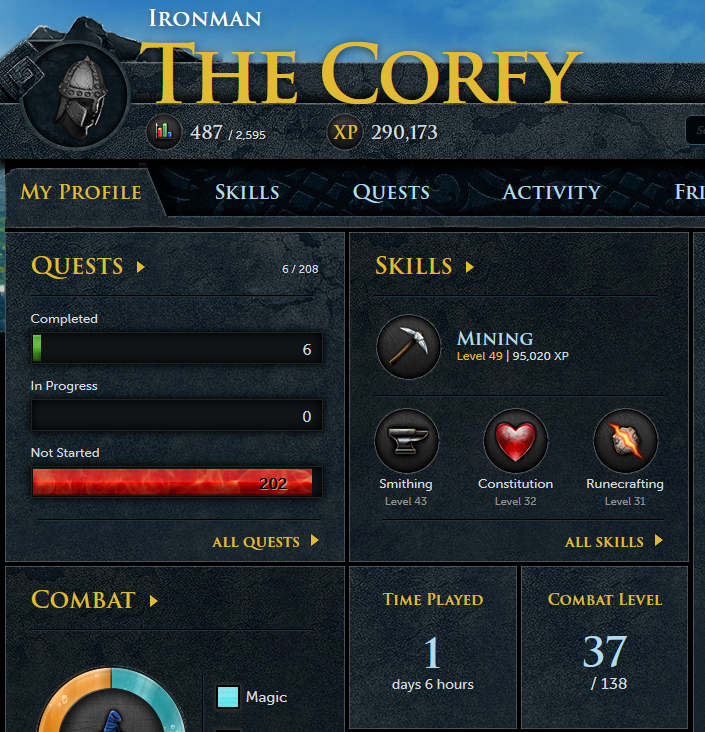 Maxed combat, so probably only a few hours a week for clan related goings on. Played a bit longer this past year and accomplished much more in my time. No more bank standing for me. I'll probably log on once or twice for old times sake. Couple hours a day. I start losing focus if I play anymore than that. Probably only a few hours a week for whenever im available to assist my clan in fighting for justice within the wilderness. I usually play 3 hours a day unless I have a ton of irl **** going on. I envy people who could realistically say "I'll be playing x about of hours this whole year" because that means your life is so stable and normal that nothing will interrupt your playing time haha. 3 hours a day every day is 1008 hours. But i'll have some days i'll play 12 and others I wont log on for a few days so.. idk. Average 5 hours a day for 12 months? So 1680~ hours. Sig Made By Bobwithagot2. Thanks! Spent most of my time AFK training last year, so I probably won't match that amount of online hours. I've only been logging in recently for clan events which probably occupy ten or so hours a week. I'll probably spend most of my time AFK training until school is done, then I'll have much more time to pay attention. looks good! ps loving the name!! I frequent these forums quite often, at least once a week but i don't play. So.. Total it shows: 64d 16h 52m 41s of online time spent on these forums, i kinda of always leave a tab open for zybez.. Minimized somewhere. It will be safe to assume that clock will reach up to 70d by the end of the year or more . But god forbid i ever come back and play this game or any game. First year of uni so I'm afking as much as possible, so I'll likely be online for a high number of hours, but not doing all much, cutting ivy etc! Not really many at all. I might play again in the spring but for now I'm on hiatus from the game. The Corf has been quintupled! Edited by The Corf, 13 February 2015 - 4:19 PM. I usually spend 10-20 minutes watching clans fights and then log because it turns to 1 item fest or ddosin the worlds, so maybe 30 hours this whole year. 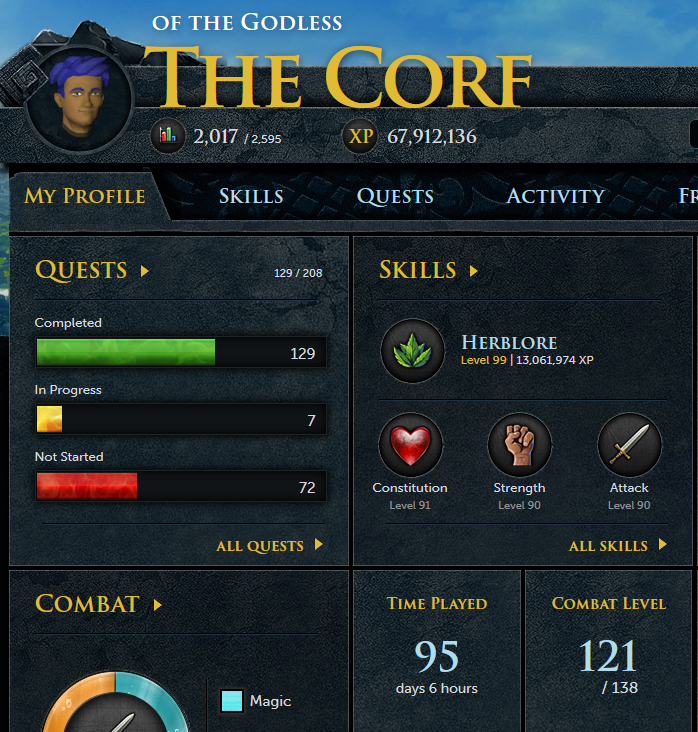 Since I just recently returned in December, I still have a lot of skills to level up to my goals (all 60+) but apart from that I only really play for clans and once I reach my skill goal I'll only be really playing to make money for clan supplies and to take part in clan events so I'm not predicting too much time, when compared to how I was back in the day . Also back in the day I didn't have too many real life obligations (like a full time job, girl, bills, errands, etc) so what little free time I do have to play the game will most likely go to clan events. It usually depends. May the whole day or few hours in a day. It mainly depends upon my mood.